With the introduction of the z10 server, a new function CPU MF (CPU Measurement Facility) was incorporated. CPU MF provides optional hardware assisted collections of information about logical CPU activity executed over a specified interval in selected Logical Partitions (LPARs). The CPU MF counters function is intended to be run on a constant basis to collect long-term performance data (I.E. SMF Record 113), in a similar manner to how you collect other CPU performance data. This new performance data source provides an insight into the actual CPU performance of the actual customer environment, thus refining the accuracy of capacity planning activities when compared with LSPR data. The actual process of Capacity Planning for the IBM zSeries Mainframe could also be refined, streamlining the periodic (E.g. Daily, Weekly, Monthly, et al) data collection and subsequent analysis process. Of course, the starting point for data is always the RMF/CMF data (SMF Type 7n), but perhaps a non-proprietary Performance Data Base (PDB), containing all pertinent data for CPU analysis, including SMF 113, could optimize this process? PerfTechPro are focussed on delivering products to their customer base that make their work easier and more effective, designing PerfTechPro to be as flexible and easy-to-use as possible. For example, with PerfTechPro, you're not limited to a proprietary, or even a single database for performance data retention. PerfTechPro enables the use of any platform or any relational database (E.g. Microsoft Access, SQL Server, MySQL, Oracle). PerfTechPro is also designed to support a wide breadth of performance data sources (E.g. SMF, RMF, CICS, DB2, CPU Measurement Facility), while also providing conversion capabilities for historic CPU usage data stored in other performance databases. 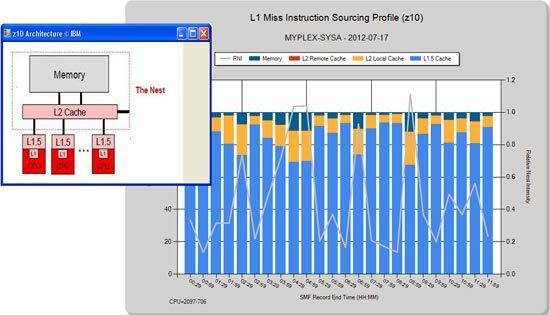 This focus on usability and flexibility makes PerfTechPro an exceptional tool for Capacity Planning and Performance Measurement activities (I.E. CPU Sizing, Forecasting, Modelling, Correlation Analysis). By analysing a small subset (E.g. 24 Hours) of your business specific SMF data (E.g. Type 70, 71, 72, 73, 75 & 113 records), upon request, we can create a set of PerfTechPro for z/OS reports representing your business, which can be used for an iterative discussion process via a Web Conference, as and if required.